I don’t know about, you but two of my favourite summertime foods are watermelon and tomatoes — especially if they are both right from the garden. This year, my tomato harvest is showing signs of a prolific harvest. If I needed to describe what summer tasted like, this salad would definitely fit the bill. Sweet, crisp, cool, savory, refreshing and satisfying! And super nutritious. Both watermelon and tomatoes are high in lycopene, a phytonutrient that is especially important for cardiovascular health. Both also contain potassium that helps nerve and muscle function and helps to maintain the body’s proper electrolyte balance. They are also both high in vitamin C, which protects the skin from free radical damage after exposure to the UV rays of the sun. This is what summer would taste like if you mixed it all together in a bowl! • Cut watermelon into bite-sized pieces. • Seed tomatoes and cut into bite-sized pieces. 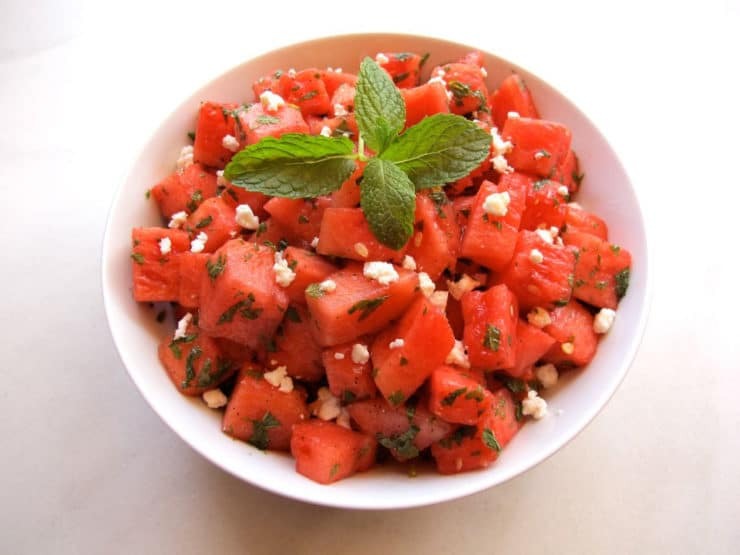 • Combine tomatoes and watermelon in a serving bowl. Add chopped mint and feta cheese if desired. • Prepare Sweet Balsamic Dressing by combining the olive oil, balsamic vinegar, lemon zest and juice, honey, mint, salt and a dash of pepper in a blender and blend until combined and creamy. • Gently toss in 1/4-1/2 cup dressing and sprinkle with more fresh ground pepper if desired. • Serve immediately. Serves 4-6, if you’re willing to share!